Gallop off on the ultimate Derby experience with one of our exclusive Kentucky Derby Packages from TicketsatWork. Take in the action from first-floor seats in the Grandstand, and enjoy premium accommodations in the Louisville Marriot Downtown, entry to the Kentucky Derby Welcome Reception featuring horse racing talent and transportation to and from the events. After Justify wowed the crowd last year by taking the Triple Crown, the Kentucky Derby is ready to honor a new champion in 2019. Mark your calendar for May 4, when the top race horses will line up at the starting gate on the fabled track of Churchill Downs. Since 1875, this historic racetrack has been the scene of unforgettable photo finishes and dramatic come-from-behind wins. The horse racing world turns its attention to Louisville, Kentucky, on the first Saturday of May every year to see who will race to the finish line first. Be there for the legendary Run for the Roses, to experience one of the most exciting two minutes in sports. TicketsatWork also offers regular Kentucky Derby tickets from $87, so you can be part of the action no matter what your budget. Spring Break is here, and if you haven’t decided on a fun vacation just yet, today we’re spotlighting 10 theme parks that would be great destinations for your next family getaway. Last chance to book your spring break – save up to 50%! Play and splash around with the beauty of the Great Smoky Mountains as your backdrop. Adjacent to Dollywood theme park, the waterpark features water slides and wave pools, raging rapids, lazy rivers and water coasters. Dollywood offers 40+ rides, live entertainment and great dining. Dollywood’s Festival of Nations runs until April 14, featuring music, dance, food and art from around the world. Focused on families with kids, the new Wildwood Grove opens May 10 with rides, indoor/outdoor play area, and even a 55-foot-tall, interactive Wildwood Tree. Save now! 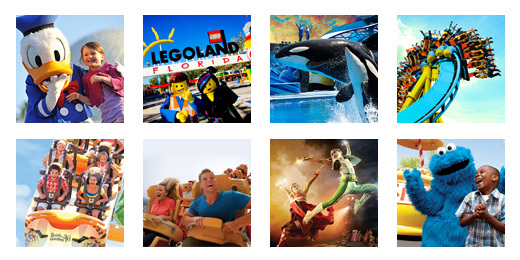 Visit TicketsatWork.com today for special ticket prices to all the best theme parks. Get ready for Spring Break adventures!